Mayday Rescue was founded by James le Mesurier, who founded both Mayday Rescue and the White Helmets after “retiring” from the British Army and the Foreign and Commonwealth Office. Mayday Rescue has its headquarters in Istanbul, Turkey, where it runs a training program for the White Helmet recruits. Mayday Rescue’s annual budget is $35 million, with the funds coming from USAID, the UK Conflict Security and Stability Fund, and the Kingdom of Saudi Arabia. To date, an estimated 3,000 recruits have been through the Mayday Rescue training programs and deployed into 120 different locations in rebel held parts of Syria. Another element of the British government flowchart backing the White Helmets is the communications and media firm Incostrat, founded by Paul Tilley, another British Army veteran, who ran the Ministry of Defence’s Strategic Communications for the Middle East and North Africa. Tilley ran British government communications during the Libya invasion, working directly out of 10 Downing Street. In November 2014, soon after le Mesurier was founding Mayday Rescue and the White Helmets, Tilley “retired” from the British service to found the strategic communications firm. 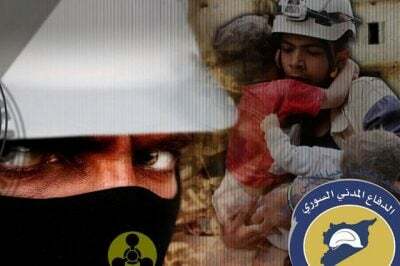 Incostrat provides the social media and other communications services for Mayday and the White Helmets. Colonel Walter Patrick Lang, Jr.